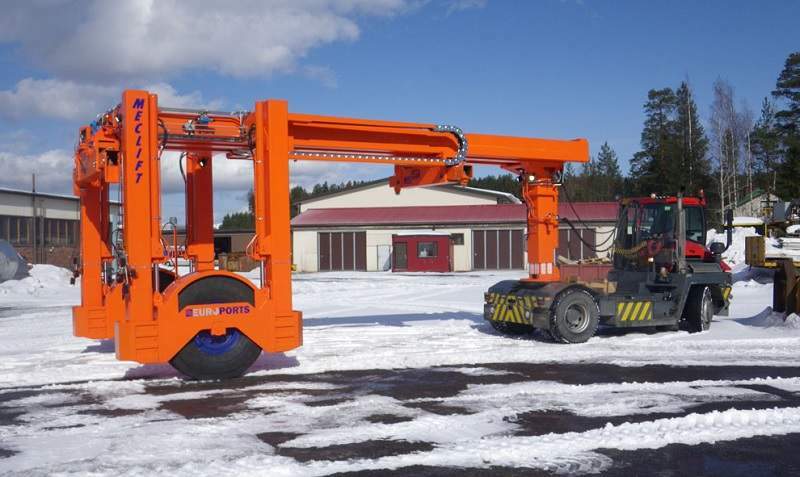 The Container Mover ML36CM is a cost-efficient solution for terminal areas and locations, where there is a need to move containers from place A to place B. This equipment handles all container sizes ranging from 20ft to 45ft, including High Cube containers, and lifts them on and off normal highway chassis. Our container handler can also be customised to handle one particular container size. ML36CM fits through narrow terminal doors, and under bridges in road traffic. Certain requirements taken into consideration, it can be attached practically with any terminal tractor brand. Work safety is improved by open forward-visibility from the terminal tractor’s cabin and smooth operation. There are no sharp impacts on the reaching device, which provides better work ergonomics. Due to its compact and clear design, usability of the machine is very good, and need for maintenance is low. Attached to a terminal tractor, ML36CM is powered by the terminal tractor’s hydraulics. The length of the main beam is automatically adjustable for different container sizes, and the height of the machine can be raised and lowered for loading and unloading containers on trailers or on ground. Front and rear twist-locks can be separately adjusted sideways to grip the container.